A simple, free, easy to use Dutch Oven Calculator. 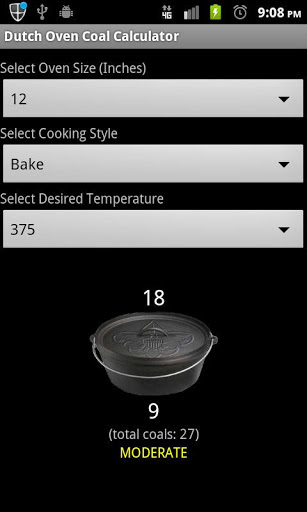 The calculations in this application are based closely (but not exactly) on the values published by Lodge Logic®. NOTE – If you are not using Lodge® cookware, you may need to make adjustments for your particular oven brand. Cooking style can be changed to bake, roast, stew or fry. Me gustaria aprener la letania del rosario en audio.y un rosario oara difuntos.me gusta escuchar este es muy bello Dios les bendiga..gracias x sus enseñanzas.